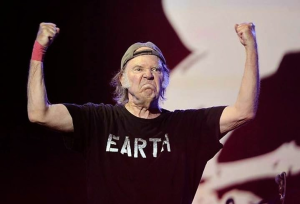 When Donald Trump’s presidential campaign kicked off in front of a crowd of partially paid supporters to Neil Young’s “Rockin’ in the Free World” (and while riding down on an escalator, no less), it did not go over well. Trump’s camp claimed they paid both ASCAP and BMI for rights to the song, but would cease from using it out of respect to Young. The singer, meanwhile, out of respect to his own political beliefs, has turned around and given Trump’s opponent Sanders permission to use “Rockin’ in the Free World”. Sanders, the Democratic candidate from Vermont, walked out to the track at a rally in Denver attended by an over-flow audience of 4,500 people. Folks were reportedly standing in the atrium and lacrosse fields outside the auditorium to hear Sanders speak; as far as we know, none of them were paid to be there. Watch footage of Sanders’ “Rockin’ in the Free World”-aided entrance below (scroll to the 5:00 mark). “The songs just happened. First thing in the morning, I\'d pick up a guitar, play two or three chords and go, \"That\'s the blueprint. That\'s what my soul told me, so that\'s what it is.\"
Then I\'d go to the studio. I would write the words, without guitar, in my car. I\'d keep stopping on the way -- write two verses, go a hundred yards, stop, write some more. I kept moving, and writing, until I got to the studio. by Neil Young, Rolling Stone Interview, 4 Sept 2003.